Australian director Cate Shortland's debut feature 'Somersault' appeared in the prestigious Un Certain Regard section of the 2004 Cannes Film Festival. 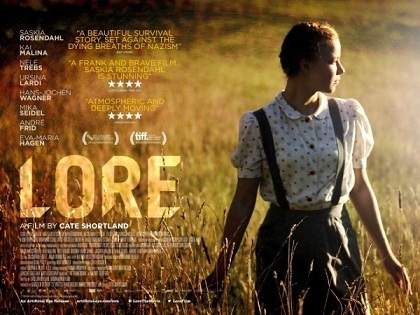 It's taken almost ten years for her return to the world of feature films, with 'Lore', an atypical and atmospheric Nazi drama. As World War II draws to a close, five siblings have to make their way across Germany to their grandmother's home, following the arrest of their Nazi parents. Led by the eldest, Lore (Saskia Rosendahl), the family soon find that everything they believed in is untrue and their journey fraught with danger. The oft gloomy cinematography typically captures the sense of disorientation experienced by the siblings - both as they explore new territory and their beliefs are challenged. Cinematographer Adam Akapaw is building a formidable reputation and back catalogue having also been responsible for the excellent 'Snowtown' and 'Animal Kingdom'. The acting is uniformly excellent but the central leads Saskia Rosendahl and mysterious stranger Kai-Peter Malina are of particular note - their characters sharing an uneasy chemistry as Lore tackles her inherent mistrust. The score by Max Richter is similarly impressive at times, excelling in its most ominous, string-laden moments. 'Lore' successfully reflects the blinkered nature of humanity and the difficulty of overcoming strongly held belief, regardless of how wrong they truly are. The film examines a situation rarely explored in WWII drama, albeit perhaps without the emotional resonance it strives for - somewhat due to its slow pacing. 'Lore' is out in UK cinemas today, through Artificial Eye.